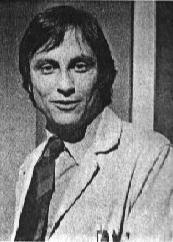 Portrayer: David Ackroyd, October 14, 1974 - August 25, 1977. Departure: Left after Rachel Cory spurned his renewed advances. Introduction Scene: To Russ Matthews at the hospital, "Morning, Russ." Exit Scene: To Corinne Seton in her apartment, "Call me in Boston if you need moral support, huh?" Relatives: Corinne Seton, cousin. Olivia, cousin. Dates: Barbara Weaver (1975), Iris Wheeler (1975), Pat Randolph (1976), Rachel Cory (1977), and Gwen Frame (1977).